Now, Breeding flowers and trees is no longer a guessing game . Lovebay Dual Head Led Grow Light helps accelerate the growth of indoor plants. Rapidly improve the health of plant and growing, leaves grooming within 2 weeks of using this growing lamp on a daily basis. 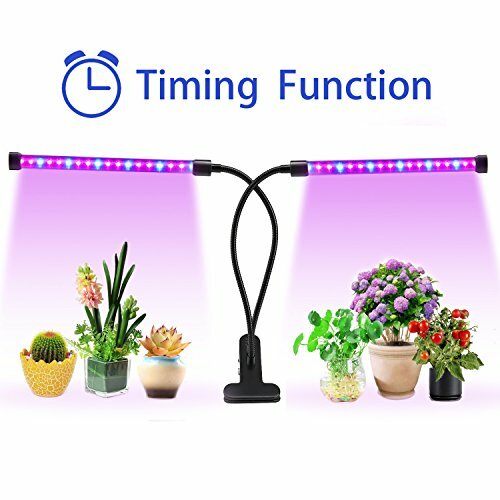 With this latest timing function USB plug in grow light , you can not only set it up for lighting 3 hour / 6 hour / 12 hours, but also adjust the brightness of the light and the distance between the light and plant according to plant needs. Note: This is A ONE-WAY TIMER, user can set it up to turn off automatically after 3H/6H/12H, but have to turn it on manually every day. BLUE LIGHT influences the formation of chlorophyll, enabling the plant to intake more energy. Plants that receive plenty of blue light grow with strong, healthy stems and leaves. This process is called photomorphogenesis. RED LIGHT contributes to the optimal development. It's essential to a plant's early life for seed germination, root growth, and bulb development. It also makes the plant yield better results when flowering. 2. Generally this grow light should be turned on for 5 hours one time, 2 times every day. Upgraded Timing Function : This is the latest timing function USB plug in grow lamp, you can not only set it up for lighting 3 hour / 6 hour / 12 hours, but also adjust the brightness of the light and the distance between the light and plant according to plant needs. Note: This is A ONE-WAY TIMER, user can set it up to turn off automatically after 3H/6H/12H, but have to turn it on manually every day. 36 LED Beads & 5 Dimmable Levels : 36 LED Plant Growing Beads (24 red & 12 blue) .This upgrade version is ultra bright, lower heat and lower power consumption, high luminous efficiency and long service life. It has 5 Dimmable Levels brightness, you can adjust it according to plant needs. USB connector& Clip Design: With the USB design ,you can choose to plug into a wall outlet or an USB interface. There are 3 ways to fix the clamp (Clip, Screw or Stick). Easy to install at your home or office. Note : the input voltage to the USB Adapter must be less than 110V! 360 degree flexible neck & Wide Linear light: This dual-lamp with 360 degree flexible neck and clamp is easy to adjust and place anywhere. The Wide linear light design let it can cover a larger area and provide energy for more plants. BLUE LIGHT influences the formation of chlorophyll, enabling the plant to intake more energy. Plants that receive plenty of blue light grow with strong, healthy stems and leaves. RED LIGHT contributes to the optimal development. It's essential to a plant's early life for seed germination, root growth, and bulb development. If you have any questions about this product by Lovebay, contact us by completing and submitting the form below. If you are looking for a specif part number, please include it with your message.